Coming up with your own flower garden ideas is not always as easy as it sounds. Not only do you have to design the garden, pick the right plants to go into it, make sure you have good soil and the proper lighting, but you also have to find the time to actually do the work itself! We have put together a great list of ideas that you can use for just about any garden you can think of. You can use these ideas in part, or in their entirety, it's completely up to you. Hopefully some of these ideas will spark your imagination! Colorful Flower Gardens: If you prefer your gardens to be masses of bright and colorful blooms throughout the growing season, check out some of these great flower garden ideas that you could model one of your own gardens after! Who doesn't like to see their garden just exploding with color after all the work we put into them? Country Flower Gardens: A lot of gardeners out there love the traditional country look with growing vines, rustic split rail fences, and all the décor you can fit into the garden. We have put together some great articles on building a country flower garden with all the bells and whistles. Cut Flower Gardens: Have you ever wanted to start a garden just so that you could have fresh cut flowers available all the time? You are certainly not alone and a great many people garden for just this reason. We can show you how to get started and what cut flowers are the easiest to grow! Flower Garden Designs: This article can help you come up with countless flower garden ideas that you could implement in just about any size space around your home. From annuals to perennials, bulbs to evergreens, we have got you covered. Flower Garden Edging: So many of us fret about our gardens, but how many of us have ever thought about the transition between the flower beds themselves and the grass that we walk on? There is a multitude of garden edging options available on the market today and we've decided to lay a few of them out for you here. Flower Garden Planning: Are you a new gardener who would love to get started planting, but you just are not sure where to begin? The process might seem daunting but don't worry, here we will guide you step by step towards creating your very first flower garden. Flower Garden Plans: In this article we will present a variety of different flower garden ideas that you might use in various places around your home. You can take the ideas exactly as they are, or you can pick out the pieces you like and incorporate them how you see fit. Your options are near limitless and all the information on this site is completely free! 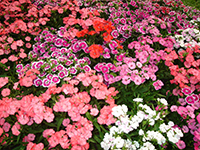 Flower Garden Supplies: Starting the right flower garden means using the right supplies from the start. If you have never purchased garden supplies before and aren't sure where to begin, you should read this article. We will explain all the tools and supplies to you that you would need to get your gardens started off right! Flower Garden Theme Ideas: So you are an experienced gardener who wants more from your yard than just some well planted garden beds. That's understandable! Maybe you prefer to lay your garden out into themes, much like interior designers create rooms inside a home. We can help! We've put together a collection of different garden ideas that you might want to consider on your next project. Garden Flower Guides: With all the plant and flower options out in the market today, how is one supposed to weed through all the options to decide what might work best for them? Here we've taken the most popular grown flowers and plants and broken them down into an easy to use growing guide. Home Garden Flowers: Have you ever found yourself walking through your neighborhood and a flower in someone's garden caught your eye but you weren't sure what it was? In this article we will help you identify many plants and flowers commonly found in today's gardens. Perennial Flower Garden Designs: With all this talk about flowers, we thought it a good idea to dedicate an article strictly to starting flower beds with perennials. Let's face it, most of us in our busy day to day lives don't always have time to manage our yards the way we would like to. Perennials are a great way to get multiple seasons out of a single planting, and keep the garden looking great for longer! Perennial Flower Garden Ideas: Find great ways to start incorporating perennials into your existing garden designs today. Perennials are a great way to balance out a garden and add longevity to your designs. There are many perennials out there that would thrive in your garden so browse through a few today and see if any strike your fancy. 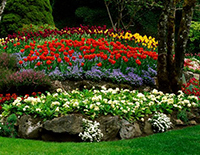 Photos Flower Gardens: Find photos of various flower gardens today. If inspiration is what you are looking for, we can certainly help. Our website is filled with great gardening ideas that you can take and use just about anywhere. If you can't find a great garden idea here, then you aren't looking close enough! Spring Flower Gardens: Learn how to lay out a garden that welcomes in the spring time with a bright and colorful bounty. Nothing helps wash away the winter woes better than a garden that just bursts with color and blooms as soon as the weather breaks. We will show you all the great plants you can use to make your very own spring garden. Summer Flower Gardens: Once the spring rush is over and your bulbs are done blooming for the year, what do you have to turn to? Summer gardens are a great way to keep the joy going throughout the growing season. There are plenty of plants that bloom late in the year, learn how to use these to extend your garden all season long!